Our aim is to make your stay as comfortable, relaxing and enjoyable as possible, and when kitting out the cottage we've tried to cover as much as possible in order to fulfil this aim. The accommodation is all on the ground floor with level access at the rear. It comprises: Lounge/dining room/kitchen, 1 double bedroom, bathroom with shower over double width 3⁄4 bath, toilet & basin. There are slate floors throughout with underfloor electric central heating. In combination with the construction of the cottage, which includes the use of structurally insulated panels, this keeps the cottage warm and cosy at all times. There is a 5 ft double bed in the bedroom and there is extensive wardrobe and cupboard space fitted out to provide a variety of storage options. In the bathroom the deep 3/4 bath was specially constructed to fit the alcove in which it is located and is designed for use by two people. 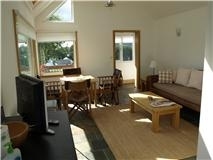 The cottage is fully furnished and fully equipped. Included are: Freeview TV; DVD player (small library); Radio/CD; Fridge; Electric 2 ring hob; Combi microwave/oven/grill; Freezer; Washer/dryer. The accommodation is let on a fully serviced basis and all fuel (electricity) and power costs, bed linen (duvets and Egyptian cotton sheets) & fluffy white towels are included in the price. 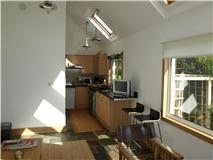 The cottage is located on a quiet private lane and there is off-street parking for 2 cars immediately beside it. 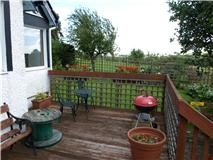 There is an enclosed lawned garden with decked sitting out area and furniture and BBQ. We're very sorry but much as we love animals and understand how difficult it is to leave them behind for holidays we don't take pets. Where guests stay for more than one week a weekly change of bedlinen and towels and a light weekly clean are included in addition to the other services. Bookings are usually Friday to Friday (different entry and exit days and periods shorter than one week by arrangement). A welcome pack is provided. This includes: regular tea, a selection of herbal teas, coffee, sugar, milk, shortbread, salt and pepper. Washing up liquid, j-cloth, kitchen paper towel roll and toilet paper are included along with hand soap in dispensers in the kitchen and bathroom. A continental breakfast pack including for example croissants, fruit and fruit juice (contents may vary according to season and availability) can be supplied on request at an additional charge of £5.00 sterling per person per day supplied (except where payment is made at the full rate when it is included in the price). Additional services such as grocery shopping at cost may be available by arrangement. Use of the owners' sauna may be available by arrangement, subject to terms and conditions. We believe that there is good 3g coverage. Many guests bring their own dongle and do not have any difficulty with internet access. However, of course we cannot guarantee this. If internet access is important please contact us about this. 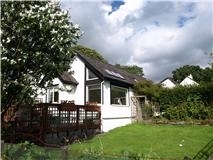 The cottage is located in a rural farming area and guests should be aware that from time to time, particularly during summer months, there may be farming activity close by.